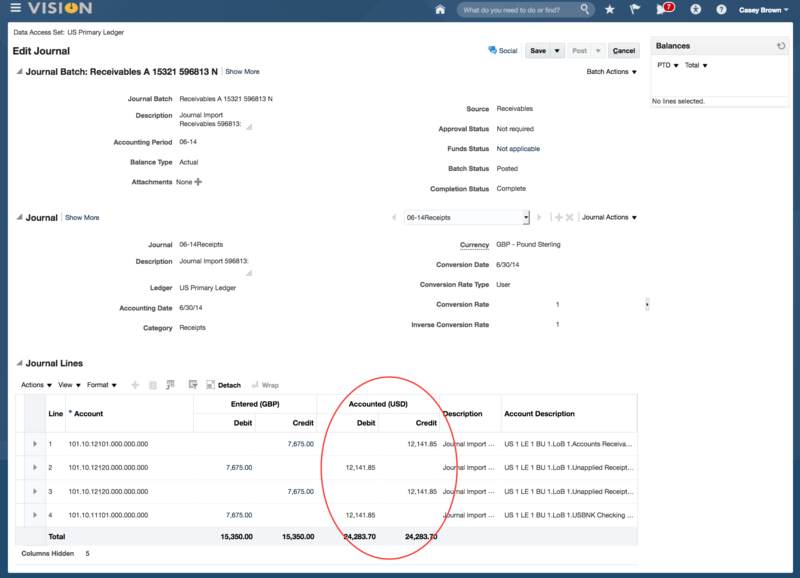 Oracle ERP Cloud (aka Financials Cloud or Fusion) has extensive multi-currency functionality, as you’d expect. This post looks at the basics of how this works, for transactions and their resultant balances. The balances for all accounts are held against a ledger. 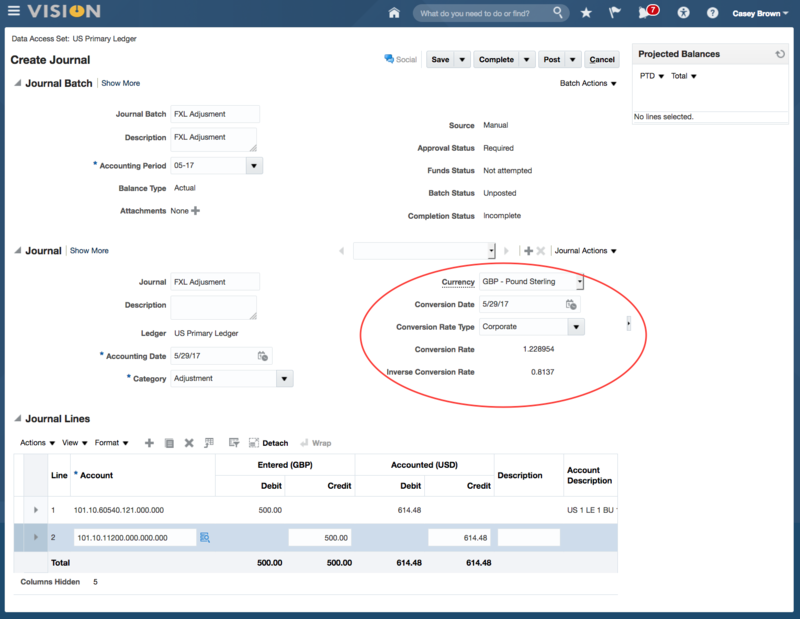 These balances are updated by financial transactions from all parts of ERP Cloud. A single ledger stores balances for an organization or group of organizations that share the same Functional Currency, Accounting Calendar, Chart of Accounts and Accounting Method. So each Ledger has a single ‘Functional Currency’, which is the prime reporting currency for the group of organizations. Oracle has the ability to set up additional reporting currencies, but we’re sticking to the basics here so we’ll leave that for another post. Multiple Ledgers in different currencies, that you may need to translate and consolidate. Transactions and balances in foreign currencies within a Ledger. A financial transaction is done in the context of a Ledger. The transaction currency defaults to the Functional Currency of the Ledger, but you can change it to any currency you have enabled. If you do change it, the transaction is defined as Foreign Currency. For every transaction, Oracle stores the amount in Entered Currency (currency of the transaction) and Functional Currency (the equivalent in the Functional Currency of the Ledger). * – The special rate type ‘User’ allows the user to enter their own exchange rate for the transaction. When Foreign Currency transactions are transferred from a sub-ledger to the GL, they are created as journals in GL. These journals are in the Entered Currency of the transaction, with the Functional Currency equivalent stored against each line (debit or credit). Note that the conversion rate is not stored on the journal header and the Conversion Rate Type is set to ‘User’. This is because a single journal from the sub-ledger could include multiple transactions using different exchange rates, so instead the Functional amount is stored on each line. By contrast, a manually entered journal will use a default exchange rate type so that the rate held in the system is brought into the header and used for all lines. When journals are posted, they update the account balances. Account balances are stored for Foreign Currencies as well Functional Currencies. Note that the Foreign Currency balances represent the total of only the journals in that particular Foreign (Entered) Currency, whereas the Functional Currency balances represent the sum of journals in all currencies, using the Functional Currency equivalent. So, when a Foreign Currency journal is posted, it will update two balances; one for Foreign Currency and one for Functional Currency.